Here's your one-stop shop for all things DISNEY INFINITY! As new playsets, figures and accessories become available this page will get updated. Support this site by using our Amazon links below! Introducing DISNEY INFINITY, a unique toy based video game where a spark of imagination unlocks the freedom to play with some of your favorite Disney and Disney/Pixar characters in their respective worlds like never before. Game features include: extreme game customization and character mingling in 'Toy Box' mode, the inclusion of everything needed for initial play including the base peripheral and three initial character figures, multiple virtual play areas, additional collectible characters/figures, single-player and multiplayer options, and unlockable online and mobile content. With DISNEY INFINITY players truly enter the worlds of their favorite Disney/Pixar franchises, and wield the abilities of their favorite characters. 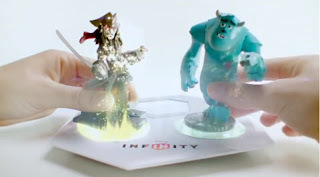 Simply place your INFINITY figures onto the game base to jump into a play set and experience original adventures in the worlds of Monsters University, Pirates of the Caribbean and The Incredibles. Take on the role of Sulley, the naturally gifted 'scarer'; become Captain Jack Sparrow, the incorrigible sword-wielding pirate; or transform yourself into Mr. Incredible, one of the world's greatest crime-fighters. Battle enemies, solve puzzles, overcome obstacles and complete a variety of other unique quests. You can also create your own world - the choice is yours in DISNEY INFINITY. Unlock virtual toys from each play set -- characters, buildings, weapons, gadgets and more –- and bring them into the Toy Box where you can mix them all up to create your own game. In the Toy Box, there are no rules and you can create any adventure you want. The only limitations are those of your imagination. Share your one-of-a-kind creations with your friends with up to 4-player co-op play, and enjoy the option to collect more characters. The more you play, the more you unlock - and the more you have, the more possibilities for play. Players can add new INFINITY play sets and figures as the franchise continues, and can even take their DISNEY INFINITY experience to a whole new level with Power Discs – an all new way to unlock character powers, fun gadgets and new ways to customize your world. But remember, the story never ends. The DISNEY INFINITY Starter Pack is just the beginning, with many more Disney and Disney/Pixar characters and worlds coming soon, giving you infinite ways to inspire your imagination. Three initial INFINITY Play Sets: Monsters University, Pirates of the Caribbean, and The Incredibles. STARTER PACKS - please select your system. If a link is not visible please refresh your browser. PLAYSETS - not machine specific. FIGURES - not machine specific. POWER DISC SET - not machine specific.